We should note some important properties of horizontal lines. First off, any horizontal line $y = a$ **always* has a $y$-intercept since the line must pass through the vertical $y$-axis at some point, namely at the point $(0, a)$. 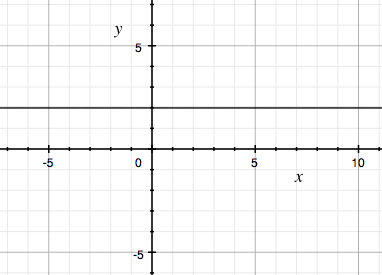 Furthermore, we note that a horizontal line never has an $x$-intercept unless the line is $y = 0$. Furthermore, we note that the equation $y = 0$ is the equation of the $x$-axis, which has infinitely many $x$-intercepts. Once again, there are some important properties to note regarding vertical lines. Any vertical line $x = a$ always has an $x$-intercept since the line must pass through the horizontal $x$-axis at some point, namely at the point $(a, 0)$. Furthermore, a vertical line never has a $y$-intercept unless the line is $x = 0$. If our line is $x = 0$, then we have infinitely many $y$-intercepts since our line is essentially the $y$-axis. 1. Graph the line $y = 5$. Write the coordinates of any x-intercepts and any y-intercepts. 2. 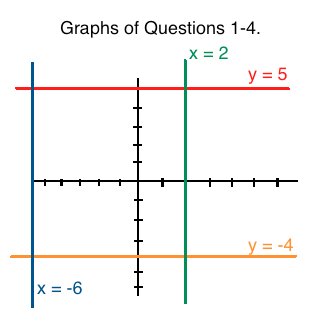 Graph the line $y = -4$. Write the coordinates of any x-intercepts and any y-intercepts. 3. Graph the line $x = 2$. Write the coordinates of any x-intercepts and any y-intercepts. 4. Graph the line $x = -6$. Write the coordinates of any x-intercepts and any y-intercepts. 5. Explain why the line $y = 0$ has infinitely many solutions. 6. 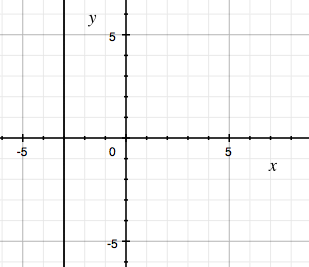 Suppose that a box is defined by the lines $x = 1$, $x = 3$, $y = 2$ and $y = 7$. What is the area of this box? 5. 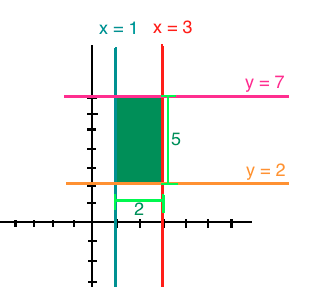 The line $y = 0$ has infinitely many solutions since $y = 0$ is the equation for the $x$-axis and hence, intersection every point on the $x$-axis. Furthermore, we can rewrite $y = 0$ as $y = 0 + 0x$, and we note that any value of $x$ still results in $y = 0$.